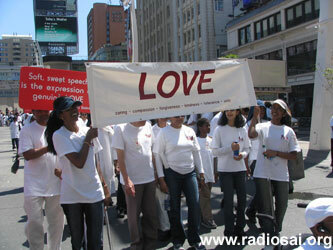 Over four thousand caring and responsible Toronto residents along with scores of Americans and a few Europeans put their best foot forward as they converged at Yonge-Dundas Square which is the heart of Toronto and then lovingly walked 2 ¼ Km in the prime streets through the downtown core, raising the level of human commitment towards universal human values of Truth, Right Conduct, Peace, Love and Non-Violence that transcend barriers of race, religion, culture and ethnicity. Apart from thousands of onlookers, tourists, drivers and shoppers, what a group of friends it drew! Barbara Robbins and her husband Bernie Michel along with friend Anjali DeSai drove all the way from Hartfort, Connecticut in the USA, as did Xavier Gomez, specially to join through the downtown core pledging self-transformation. Professor Anita Sankar from Buffalo, USA came with a bunch of friends and Miss Anita Perrson of Sweden flew in from Europe to walk through Toronto’s Yonge-Dundas area, hoping to learn how to organize a similar event in Sweden. 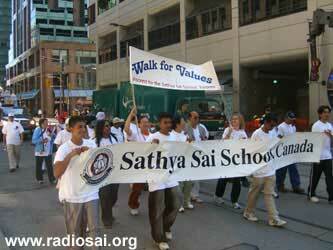 For the fifth year in a row, Toronto, the city that gave birth to the world’s most unique walkathon, rocked to the rhythm of righteousness on June 10, 2007 with the banner of the Sathya Sai School of Canada flying high. 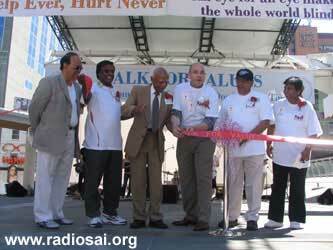 At the only walk of its kind in the world, participants neither pledged nor sought any monetary contributions. Instead, they had to introspect and pledge to improve an area of personal weakness, by promising to practice any one of the numerous universal values and their sub-values such as patience, caring, love, forgiveness, appreciation, gratitude, conservation, responsibility, discipline, better time management, self-esteem, acceptance, punctuality … you name it, you could pledge it. 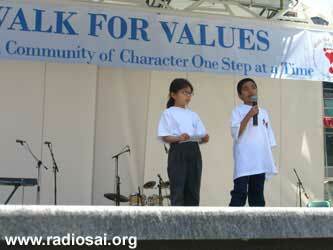 A brainchild of the Parent Council of the Sathya Sai School of Canada, the fifth annual Walk for Values is one of the school’s many community outreach projects. 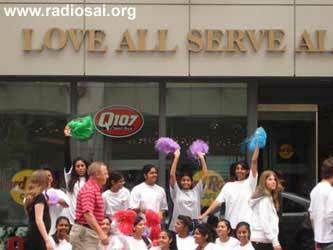 The only school of its kind in entire USA and Canada, the Sathya Sai School of Canada provides a values-based Character Education program from JK to Grade 6 founded by beloved Swami in 2000.. 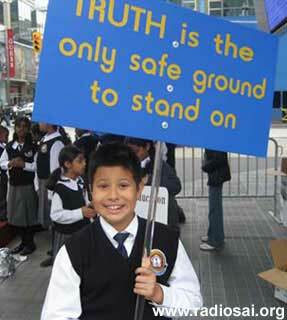 The school was also recently rated as a top Toronto school for its excellent academic performance. [To read a cover story on the school from June 2007 issue of H2H, click here]. Baba's message "Love All, Serve All"
The raison d'être behind this walk is that when individuals transform, families improve; when families work towards self-improvement, communities thrive and cities blossom and ultimately countries prosper in peace. The domino’s effect to transform the world starting with an individual effort has always been the underlying message of this walk. With each passing year, a growing number of political leaders, policy makers and community representatives have been participating in this event, expressing their admiration and appreciation for Baba’s teachings of human values and their universally appeal and relevance at all levels of human endeavours - personal, professional, community or government. 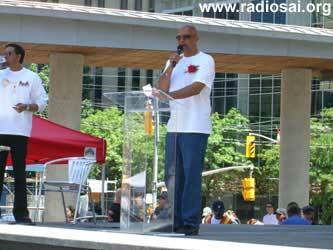 This year, Honourable Mr. George Smitherman, the Deputy Premier of Ontario and Minister of Health and Long-Term Care, and Honourable Mr. Bas Balkissoon, Member of the Provincial Parliament and Parliamentary Assistant to the Minister of Community Safety and Correctional Services were present to inaugurate the Walkathon. 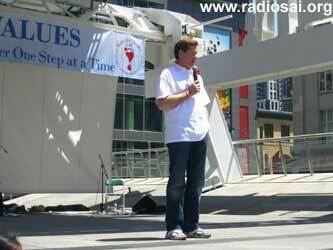 City Councillor Honourable Mr. Raymond Cho delivered a message from the Mayor of Toronto. Honourable Mr. John Tory, Leader of Ontario’s Progressive Conservative Party and Leader of the Opposition in the provincial parliament was present at the multi-cultural program that followed the walk. Prime Minister of Canada Honourable Mr. Stephen Harper sent a special message of greetings as did other Members of the Canadian Parliament. 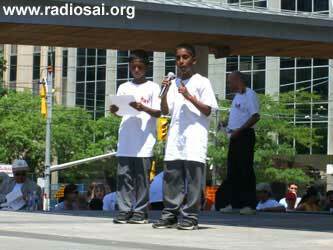 Well-known media personalities Mr. Spider Jones of the popular radio station CFRB1010 and Mr. Jake Dheer of Rogers TV took up the roles of Masters of Ceremonies along with Sai youth Mr. Rohit Vishwa. 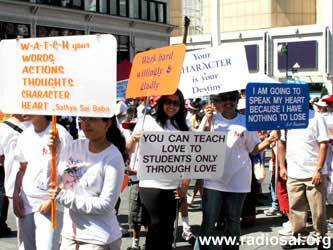 Powerful messages of self-transformation were presented, celebrated and encouraged through colorful floats, bands, placards, displays, songs, dance and dramatic presentations. The program was interspersed with seven speeches by students of the Sathya Sai School ranging from Junior Kindergarten to Grade 6. 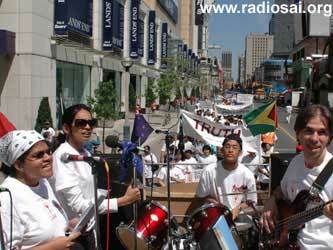 Before the event, TV Channels like ATN and Rogers interviewed the Organizers including Dr. V.P. Singh, Central Coordinator of Sathya Sai Organization, Dayal Mirchandani, President of Sathya Sai Education Trust, Dr. Revathi, Principal, Sathya Sai School, Co-Chairs of Parent Council, Mr Nathan and Mr Niranjan and also Mr. Surinder Sharma who led the Planning & Steering Committee. The Hard Rock Cafe nearby reinforced the lofty ideals of the Walk with the words ‘All is One’ and ‘Love All Serve All’ printed in gold letters on its front walls. A number of business houses joined as community partners and pledged to practice values and bring ethics in business. As always, the event was open to everyone - individuals, diverse faith groups, businesses, social and cultural clubs … as long as each participant committed to active self-transformation, leading to social improvement. One of the themes under spotlight this year was conservation of the environment. 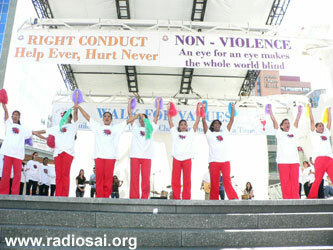 This walk this year generated a love energy like never before, charging the atmosphere at the event with joy and hope. The ever-dynamic and disciplined Sai youth energized the environment further with their exemplary behaviour and devotion to service and as always, the value girls brought smiles to all with their synchronized and meticulously choreographed moves and catchy value songs. Just observing young Sai adults performing their assigned duties with high levels of discipline and finesse was a treat for many newcomers. 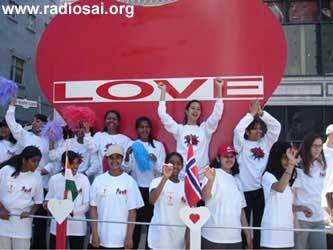 The dedicated teams of volunteers from the extended Sai family had further fine tuned the logistics of the walk, after carefully reviewing the feedback received from previous years. The theme of the walk was a ‘Walk for Me, My Family and My Community’ and the program was more family-oriented this year. 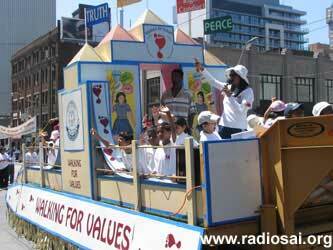 Barely had the walk concluded when a colourful multicultural carnival took off. Talented performers representing the diverse cultural mosaic that is Toronto, performed some outstanding dances while the walkathon participants settled down to enjoy their lunch. 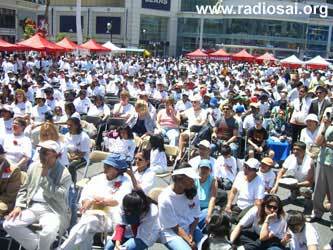 The venue at Dundas Square truly became the epicentre of Toronto’s multicultural hub with dance performances by groups representing rich and ancient traditions such as the Chinese, Irish, Russian, Latin, Egyptian and Indian. A variety of food stalls, Food Bank collection booth, exhibits on Value Parenting, henna tattoos, handicrafts, face painting and games for children were part of the carnival that attracted large crowds. 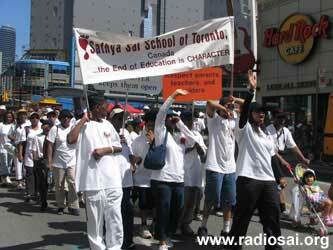 Over 18 community groups as well as students from several public schools in the York Region, including Middlefield Collegiate Institute and Cedarbrook Public School took part this year besides the large Sathya Sai School community, bringing the total number of active participants to well over 4000. 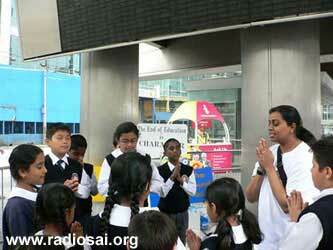 Proving that you cannot hide a good thing too long, the Sathya Sai School of Toronto is emerging as a trailblazer across the great nation that is Canada and its fame is also spreading beyond national borders. 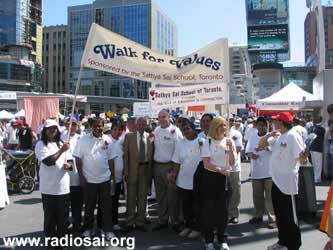 The Walk for Values 2007 took place at the same time across 9 other cities in Canada. 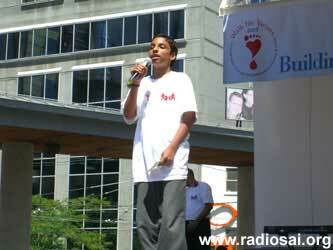 Apart from Toronto, it was also held in Calgary, Coquitlam, Edmonton, Kingston, Ottawa, Regina, Saskatoon and Winnipeg. 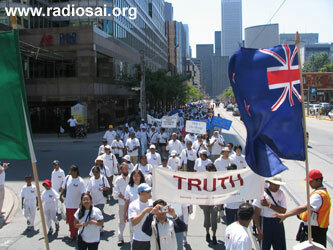 Earlier in March this year, the Walk was held nationally in Australia in cities such as Brisbane, Adelaide, Melbourne, Perth and Sydney. While Albany in USA also attempted a similar walk, some other cities in the USA are keen to learn and replicate it in their areas. .“Nationally across our great nation, the Walk in Coquitlam, British Columbia, held in collaboration with the Teddy Bear Parade, was also the best ever done in BC. 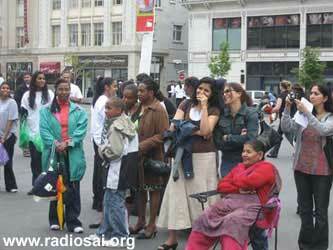 Despite the rain, the turn out was massive and the Human Values presented created a stir among members of the public. 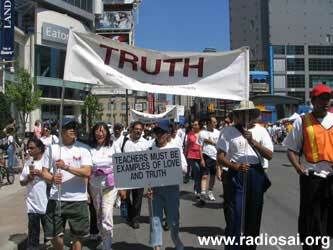 In Ottawa, participants walked in the nation's capital and on Parliament Hill itself. Kingston too walked downtown. Regina had a great turnout with the Mayor declaring the day as Human Values Day. 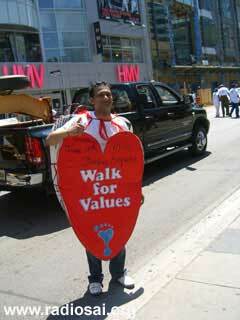 Calgary, Winnipeg, and Edmonton - all these cities had a great Walk for Values 2007.’ Saskatoon is doing their WALK on June 17th. 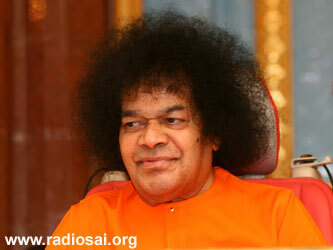 “Let us pray to Swami for His continued help in spreading His Message of Human Values throughout the World by means of these exciting and enjoyable events - by the way of ‘International Walk for Values’. " Selecting Dundas Square in the heart of Toronto’s central business district, a high visibility and frequented spot as this year’s venue proved to be the best move ever made by the steering committee. Under the leadership of Mr. Surinder Sharma, the dedicated volunteers began the planning of this event almost a year in advance by approaching various city departments for permits and coordinating the route of the walk in close consultation with the police department. 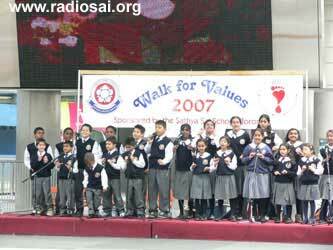 Various committees swung into action shortly after the Walk for Values 2006 concluded and the feedback from participants and committees was collated. Be it the promotions team, the T-shirts committee, the liaison group that applies for the permits and books the venues nearly a year ahead of the event, the police department contact persons, the floats design and assembly teams, the sound engineers, the Sai youth in-charge of web streaming, the value girls who meet up despite their exams to practice their value songs, the food committee volunteers who start preparing over 3000 vegetarian sandwiches and snacks a day in advance and through the night leading to the walk and storing them in a refrigerated truck ….hundreds of volunteers dedicated to Baba’s message that “the hands that serve are holier than the lips that pray” attend monthly and weekly meetings, after work that run late into the night through the long and severe Canadian winter, to ensure that when summer finally comes, Canadians welcome it marching to the tunes of such wholesome values as Truth, Beauty and Goodness. 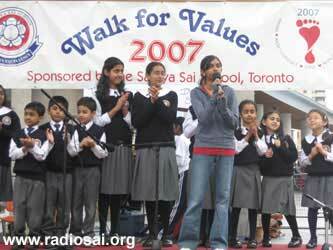 For the parents of the Sathya Sai School of Canada and the thousands of Sai devotees that live in the Greater Toronto Area, participating in the planning and preparation of the annual Walk for Values is an ideal opportunity to emulate Swami’s example of love and service. While the drive to bring awareness about individual transformation is the visible goal of the exercise, there are many more profound lessons and experiences of divine intervention and grace that are received at every step of the preparatory process. 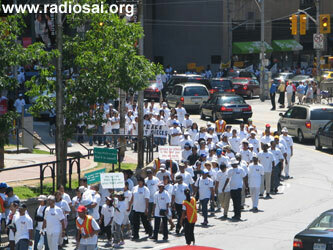 For starters, the walkathon generates pure love and unity among the many groups of Sai devotees and school parents who participate in its planning and execution. It inspires those involved to be the best they can be because the atmosphere is charged with noble ideals that the school’s Founder, Sathya Sai, personifies. The need to go back and pray and seek divine interventions is felt frequently, reminding everyone of the invisible hand of God that ensures all obstacles are overcome, even if at the very last moment. This year’s Promotions Committee is a perfect point in case. Since the organizers were venturing into a completely new territory by exploring a new venue, it was felt that it would help to promote the event at this new locale a fortnight ahead of schedule so that businesses in the area and others who frequent it would have an idea of what to expect. What seemed like a pretty simple idea at the outset proved to be quite a challenge as the proposed date approached! But for every challenge that came along the way, divine intervention and grace were available in abundance. 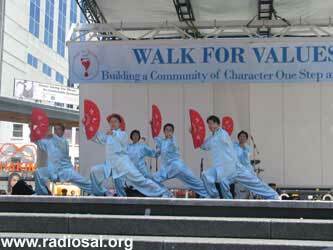 Pre-W4V Community Promotion - A Resounding Success! Two team members are busy giving final touches to their PowerPoint presentation for the upcoming community promotion event scheduled for Sunday, May 27, 2007. The promotion aims to create added awareness about the Walk for Values two weeks ahead of the scheduled event at the chosen location where it is going to be held for the very first time. Weather forecasts for the day for the Promo event look glum, forcing the planners to create back up plans and sincerely call upon the tried, tested and true intervention from the divine so as to keep the rain out of their parade, literally. And then there are always the other details that scream for attention and accommodation! 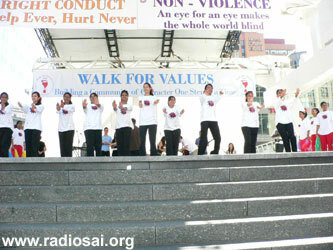 For starters, the team finds out at the very last minute of course, that, even to hold a small promotional event at venue, namely Dundas Square in downtown Toronto, where the Walk for Values 2007 will be held two weeks later, a permit from the City of Toronto is required. It is late Friday afternoon and no sanctioning officials are available! A young parent and community worker who believes in the vision and mission of the school steps in and traces the official who is authorized to sanction the permit, to her residence, and informs the organizers to fax the request to her immediately. A glimmer of hope sets in. Soon it comes to the team’s attention that the permit will cost $500! Since there is no time to seek approval from the Walk for Values committee for such an expense for merely creating pre-event awareness, one of the team members takes the leap of faith and decides to foot the bill herself. After all, the event must go on, given its importance. The meeting begins and the members make their presentation to the volunteers who are ready to participate on Sunday May 27th. Half way through, Grade 1 teacher of the School Miss Poddar, who is constantly on the line with the helpful interventionist, receives the news that given the civic and social focus of the event, the $500 fee has been waived by the city! The parents and volunteers at the meeting break into a spontaneous applause. The discussion now turns to the need for a contingency plan on the day of the promo event. After scouring through the various weather networks, it is obvious that Sunday is going to be a washout with a 70% chance of thunderstorm and rain throughout the entire day. A W4V committee member, Mr. Deo Goocool dismisses all the forecast. With utmost confidence, he asserts the day will turn out just fine! With that assurance from an unflinching Deo, the presenters resolve that come rain or shine, they intend to be there at the venue. On Sunday, the event will begin at 12 noon no matter what. At 10:30 AM on Sunday, the sky is gloomy and grey and it is spitting/drizzling/raining across the city of Toronto. Despite the uncertainty looming, everyone is trying to be optimistic. Many are praying really hard. HE Comes to the Rescue, Again! Divine intervention # 3 occurs as all participants continue to glance up towards the heavens praying that no rain comes crashing down on their efforts. By 11:15 AM, the sky decides to hold its moisture within its clouds for the next little while. The day appears calm and uneventful for now. 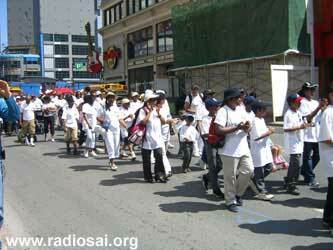 Dundas Square is a hub of activity with Sathya Sai School parents, volunteers, teachers, school choir, Sai youth and supporters all working in unity, setting up a small stage and information booth in a prominent corner, right beside what may possibly be the busiest crosswalk in Toronto. 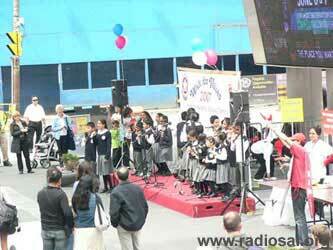 In no time, Miss Poddar begins her peppy introduction of the event that draws the attention of passersby who stop and enjoy the singing of the value songs by the school choir, looking impressive in their neat uniforms. An alumni student, Shaumithri Kulendran’s rendition of Nelly Furtado’s “Powerless” proves to be the ultimate show-stopper and spectators absolutely love the value cheers of the Value Girls, the priceless youth girls from various Sai Centres across the Greater Toronto Area. 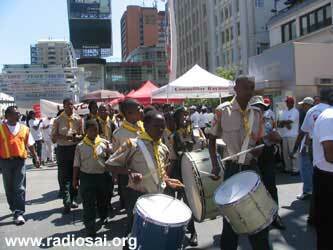 All are highly disciplined, pleasant, cheerful and spirited. People across the road literally stop what they are doing to listen and watch, thanks to the effective sound system in place. Meanwhile, volunteers led by school parents and members of the Sai family are not only handing out flyers but also engaging the public in conversation, providing them with valuable insights into the meaning and need for the Walk for Values across all the intersections within one block of the event. Numerous people are signing up to participate. “What, no money involved? Really!” Are some of the responses from the public. A young couple comes by and loves what they hear. It happens to be the lady’s birthday. At her friend’s request, the MC announces Kasha’s 21st birthday and wishes her well. The crowd joins in. 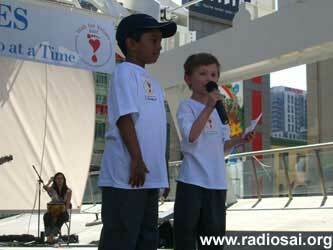 They couple promise to join us and sign up for June 10. A local school Principal stops by to enquire about the promo event. He loves what he is hearing and seeing and says he is looking for ideas for his school. Tourists in stretch limousines and tour buses stop by and lower their windows to take pictures. Volunteers step forward to hand out flyers which are well received. A group of students visiting from the USA stop and collect all the information. “This is so unique and unusual. So Canadian,” they say. 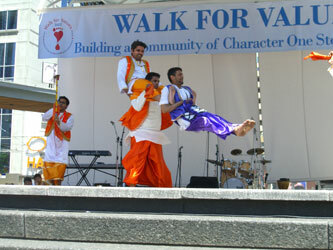 An energetic Sai youth dressed as a loving heart mascot, is running up and down the street, drawing attention to the event and sometimes taking over the microphone, entertaining the crowd with clever limericks and witty slogans. The crowd roars with applause for him. By now everyone has forgotten about the 70% possibility of rain and thunder. As if to remind us of the divine intervention, Mr. Golden Sun peeks through the clouds dispersing what remains of the gloomy clouds from before. School teachers Miss Das and Mrs. Jain are busy talking to people, explaining the rationale behind the walk and taking pictures. Miss Chandrakanthan is playing the keyboard while Miss Poddar is the MC at the event and she is also conducting the choir. 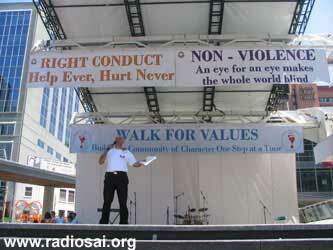 Some volunteers are handing out flyers while others are holding placards with quotes about values for everyone to see. A very happy and loving energy has infused the environment. The promotion is at its climax. Things are moving really well. 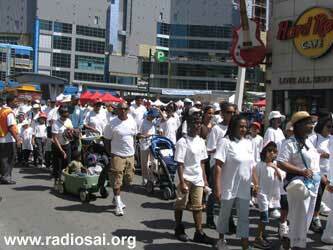 Grade 4 teacher Mrs. Ganesh crosses the road to the Eaton Centre side to check audio levels and distribute flyers. An elderly gentleman of Caucasian descent approaches her. He seems to be in his early 70’s and is dressed in a white shirt with blue pin stripes, khaki pants, hat, glasses and has a grey flowing beard. The gentleman strikes up a conversation with Mrs. Ganesh. He tells her that this promotion is not a political event, but it is simply the right thing. He goes onto elaborate on the approach of the event and claims that it is perfect. 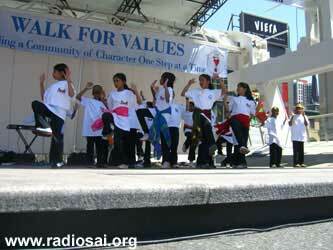 You are not pushing anyone, but simply promoting good values. She doesn’t tell him anything about the walk, but just listens, happily. Where is he getting all this from, wonders Mrs. Ganesh. He continues by telling her that when you are doing the right thing, you can’t do it the wrong way. He advises her that when we do God’s work, we get caught up and think it is our work. Not so. Actually it is He who is guiding us and doing it through us. God is selfish, he jokes, for he gets His work done regardless. A volunteer from across the road notices Mrs. Ganesh is engaged in an intense conversation with a stranger who looks like Jesus. Interesting, he thinks. “I would like you to come and speak to my children,” she says. “I will come and speak to them (your students), not now, but when they least expect it. I am a story teller. 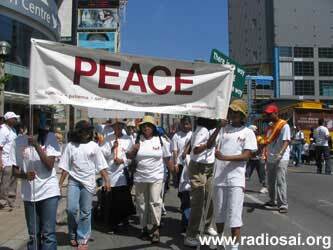 I will come to your school one day and tell them the story of the future, the story of peace,” he declares. “Where are you from?” enquires Mrs. Ganesh. “If I can have your contact information, a telephone number, I will arrange for you to come and speak to our students at the school before the end of the year,” she says. He then crosses the street with her to where the choir is singing and assures her that he will distribute the brochures as he knows 6000 people within his own voluntary organization! She hands him some copies of the brochures and he leaves with a very pleasant smile on his face. In no time, he disappears into the crowd on Yonge Street and is seen no more. The event continues full steam and more groups of shoppers, tourists, students, passersby, and passengers in transit huddle in groups to watch and learn about the upcoming Walk for Values. Many are interested and all enjoy the music and the value cheers. It’s 3 o’clock and the event is a resounding success. 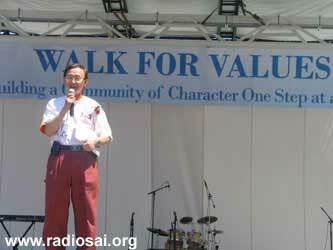 It is now at its conclusion, the MC thanks the audience for sharing the afternoon with the Walk for Values promo team and the crews begin to pack up. At 3:30pm we load the vans and the students are all on their way home. The sky decides it can no longer hold on to its moisture and suddenly at 3:30 PM, the rain begins its descent. It is raining like the Indian monsoon in downtown Toronto. The drive home is long and arduous but who really cares. The day was full of joy, full of divine interventions and so full of highs that no rain or traffic jam on the highway can dampen the spirits. “Truly, where there is Love, there is God, joy and bliss! In whatever capacity each of us played a part, we are better for it because we too made it into the direct gaze of the divine eyes that oversaw the smooth and successful execution of the day!” observes a volunteer present at the scene. 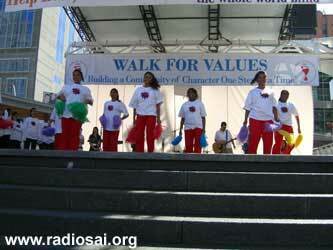 To a casual observer, the Walk for Values 2007 may have been a fun-filled celebration of Love, Truth, Peace, Right Conduct and Non-violence. To the knower within, every year’s walkathon represents a baby step towards individual transformation and a giant leap in collective efforts towards a new world order where the values will become the order of the day! Dear reader, how did you like this article? Did it inspire you? 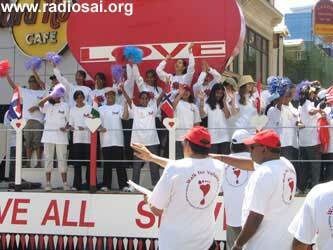 Would you like to have more of such Sai News stories? Please tell us at [email protected] Thank you for your time.